Global demand for commercial fuel cells will almost triple to $4 billion in 2017, and then triple again by 2022 to $12 billion. Motor vehicle, portable electronics and industrial stationary/motive power applications will grow the fastest. Japan and the US will remain by far the largest markets, while China and South Korea will grow the fastest. 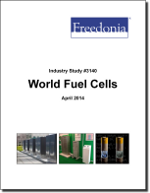 This study analyzes the $1.5 billion world fuel cell industry. It presents historical demand data for 2002, 2007 and 2012, with forecasts for 2017 and 2022 by product (e.g., systems, fuels, electronic devices), chemistry (e.g., proton exchange membrane, solid oxide, molten carbonate, phosphoric acid, direct methanol, alkaline), application (e.g., electric power generation, industrial and stationary motive power, motor vehicles, other transportation equipment, portable electronics), world region and for 16 countries. The study also considers market environment factors, details industry structure, evaluates company market share and profiles 41 industry players, including Bloom Energy, Panasonic and JX Holdings.